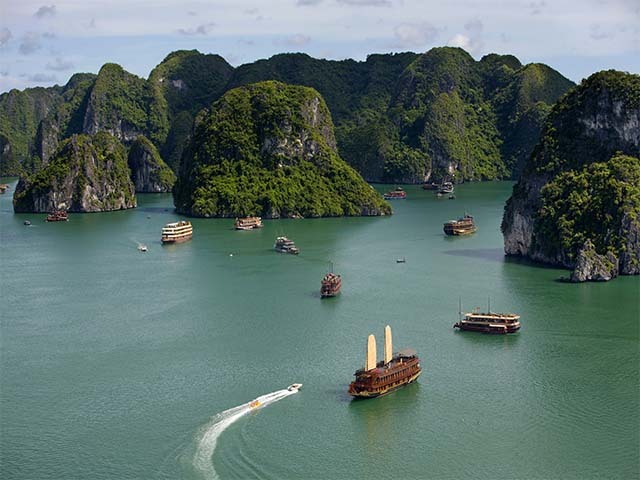 This 13-day extensive Indochina tour takes you to see three major Southeast Asian capitals in Vietnam, Cambodia and Thailand. Explore Saigon (Ho Chi Minh), Phnom Penh, and Bangkok and their surrounding country sides. Your Indochina Odyssey starts at Ho Chi Minh City. Arrive at the airport and transfer to Caravelle Hotel where you can choose to rest or head out to discover the city on your own. Start your tour the bustling metropolis of Saigon (Ho Chi Minh). Once the seat of power for the South Vietnamese government during the American war Saigon or Ho Chi Minh City as it’s officially known, is a fast developing metropolis and is very much the pulsing heart and soul of the country. Like so many cities in a globalising world, it is filled with contrasts, of wealth and of time old traditions alongside rapid modernisation. The gentle flow of Tai Chi practised in the parks seems surreal as the rest of city buzzes all around, ladies in their Ao Dais whiz by on their mopeds and everywhere the fast pace and vibrant energy continues unabated. Lively local markets can be found here as well as upmarket boutique shops and trendy bars and restaurants. Upon arrival at the airport, you'll be transferred to Caravelle Hotel, a leading 5 star hotel conveniently located in the shopping and entertainment district. Your spacious deluxe room here is contemporarily designed and built for comfort. After checking in you can choose to dine at one of the hotel's six different restaurants and bars that offer a variety of cuisine or head out to explore Saigon on your own. Go on a Saigon city tour and explore the Cu Chi Tunnels. Explore Saigon today on a city tour. Your exploration starts at Dong Khoi street where you can admire beautiful French colonial buildings built in the late 19th and early 20th centuries. Wander up to the Notre Dame Cathedral, a red brick edifice with twin spires based on the original construction from Paris. Then head across the square to the Central Post Office, designed by the French architect, Gustav Eiffel, before he had risen to fame for the Eiffel Tower. In the afternoon, enjoy a two hour drive northwest of Saigon, through urbanized areas and typical lush southern Vietnamese countryside to the famous Cu Chi Tunnels. Built in the 40’s they span around 250 kms. Several military campaigns were carried out in these tunnels during the Vietnam War. There is a section of tunnel where you can witness the examples of traps used during the war, and what remains of of bomb craters. Return to your hotel in Ho Chi Minh after an active day. Explore the Mekong Delta around Ben Tre and Can Tho, located south of Vietnam. See pagodas, take boat rides, visit Turtle Island, and walk through sleepy villages. Travel to Ben Tre on a two-hour drive south of Saigon, through lush rice paddies and fruit farms. Your tour starts with a visit en route to the Vinh Trang pagoda. Built in 1849 it is one of the first pagodas to incorporate a mixture of Asian and European architectural features. You’ll then be dropped off at the pier for a boat ride passing stilted houses and fish farms to arrive at Turtle Island. Here you have a chance to chat with the host while strolling round his garden and getting an insight into daily life on the farm. The next leg of the journey involves being paddled on a sampan through a maze of small canals before taking a short stroll through some sleepy villages to reach your next stop where you enjoy a cup of honey tea and traditional folk song. Drive to My Tho for lunch before continuing on to Can Tho, where you will be free at leisure for the evening. Stay at Victoria Can Tho Resort whose colonial-style architecture somehow feels like it belongs in the natural beauty surrounding the Hau River. Your spacious deluxe room offers modern amenities and serene views. The restaurant serves Vietnamese and European cuisine, and the bar serves a wide range of drinks including interesting Vietnamese cocktails. Explore Cai Rang floating market and the rest of Can Tho. This morning you rise early to get a unique taste of life in the Mekong. You’ll board a local boat and explore the colourful Cai Rang floating market. Here you find many traders, their boats laden with fruit, vegetables, and fish, all jostling for trade. Sellers advertise their wares by crying out across the waters or tie their goods to a tall pole attached to their boat so that buyers can see from a distance what is being sold. This is an excellent chance to try some food and take some pictures while getting a real feel for life on the Mekong. Travel to Chau Doc and visit fish farms. Travel for three hours to Chau Doc today. Chau Doc is a pleasant town situated on the banks of the Bassac River. Home to fish farming villages and floating markets, it serves as a gateway to Cambodia and is somewhat multicultural with Vietnamese, Champa, and Khmer ethnic groups living in harmony. Check in to Victoria Chau Doc Hotel and then visit a Cham village and see the fish farms where metal cages are suspended under floating houses on the river. Victoria Chau Doc Hotel is built in the colonial style and located on the banks of the Bassac River. From your spacious Deluxe Room you can see floating markets and fishing villages across the River. The restaurant here specialises in European and Vietnamese cuisine. Travel to the bustling capital of Phnom Penh in Cambodia. Travle to Chau Doc pier and take a speed boat to Phnom Penh (five-hour journey). Located at the confluence of the Mekong, Bassac, and Tonle Sap rivers, Phnom Penh has been Cambodia’s capital for most of the last six centuries. It retains a small town feel, with crumbling French colonial buildings, sprawling Wats (as the pagodas are known here), and the impressive Royal Palace and adjacent Silver Pagoda. The riverfront by the Mekong is the most beautiful part of the city and there are a number of good restaurants in which to sample local delicacies such as “amok” and watch the world go by. Stay at the luxurious and historic Raffles Hotel Le Royal. Established in 1929, the hotel has been a favourite amongst foreign ambassadors and dignitaries visiting Cambodia. This landmark hotel is located in the heart of the city and offers easy access to the Central Market and Russian Market. Stay in a beautiful State Room here that is a blend of Khmer, Art Deco and French colonial architecture. Your room comes with a private balcony overlooking tropical gardens, offering you tranquility in the bustling capital. See the National Museum, Royal Palace, Silver Pagoda, and Tuol Sleng Museum on a city tour of Phnom Penh. Go on a city tour today starting at the National Museum, home to Khmer art and sculptures from various periods of Cambodian history. Then visit the sprawling Royal Palace. Built in 1866 by the French for King Norodom it is home to the Silver Pagoda whose floor is made up of 5,329 silver tiles! The palace has been inhabited by Kings at all times with the exception of the period when the radical Khmer Rouge party took control in 1975. Under its leader Pol Pot, the Khmer Rouge seized power and declared "year zero". You can opt to learn more about these turbulent years when visiting Tuol Sleng Museum in the afternoon. Travel to Siem Reap today. After enjoying your last views of Phnom Penh, fly in to Siem Reap (airfare not included in tour cost). Check in to Victoria Angkor Hotel and take some rest or explore the city on your own. Victoria Angkor Hotel is located in the heart of the city, within close proximity to Angkor Wat. The hotel's enchanting colonial-style architecture and tropical garden form a nice oasis amidst the busy city. You stay here in a luxurious Colonial Suite that has separate living and sleeping areas, and a spacious private balcony. The restaurant here specialises in modern French gastronomy. Go on a Tuk Tuk Tour of the World Heritage Site of Angkor Wat. Explore the Angkor Complex today on a tuk tuk ride. 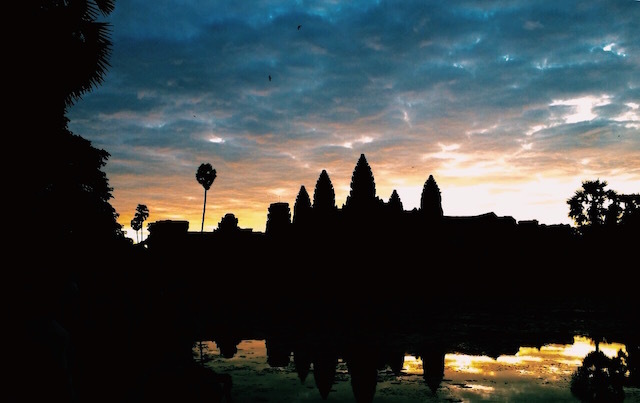 To sum up the magnificence of Angkor’s temples in a few lines is impossible. Built between the 9th and 14th centuries, the temples are devoted to Buddha and Hindu deities. A highlight within the fortified city of Angkor Thom is The Bayon temple, the third tier of which is lined by more than 200 huge, imposing carved faces which stare down from 54 towers. Other highlights include the Buddhist temple of Ta Prohm, which looks just as it did when the French explorer Henry Mouhot stumbled upon it in the 1860s, with its giant roots from the jungle seemingly reclaiming the temple. Then there is of course, Angkor Wat, a huge temple complex dedicated to Vishnu in the early 12th century and surrounded by a vast moat. Explore the country side and visit Tonle Sap (The Great Lake). Today you drive about 45 minutes into the countryside, stopping en route to visit a local village. At the quay you board a local boat for a one and a half-hour ride across Tonle Sap, also known as the Great Lake of Cambodia. Traditionally, life in Cambodia has always revolved around the Mekong River and Tonle Sap Lake which come together at Phnom Penh. During the rainy summer season, the Mekong rises so that water flows into the Tonle Sap River, causing it to change direction. See quaint stilted and floating villages across the Lake and enjoy the calm country life. You move on to Bangkok today and watch a traditional dance performance while enjoying dinner. Fly in to Bangkok, Thailand today (flight cost not included in tour price). Check in to the imperial Peninsula hotel that offers stunning views of the Chao Phraya River. The Hotel's ingenious "W" shape allows all rooms to command beautiful views of the river. Your deluxe room is a blend of contemporary and traditional furnishings that gives you a grand yet homely feel. In the evening you’ll be collected from your hotel and transferred to the Mandarin Oriental Bangkok for dinner at the Sala Rim Naam restaurant. Housed in a richly decorated Thai pavilion, reminiscent of Northern Thai architecture, the restaurant features a classical Thai dancing performance along with dinner. Explore Bangkok today on a city tour. Visit Wat Po, The Grand Palace, Chinatown, and take a boat ride through the canals. Go on a city tour of Bangkok today. Start by visiting Wat Po, also known as the Temple of the Sleeping Buddha, one of Thailand's oldest temples. The Temple is home to the famous 45m reclining Buddha statue, and is also the school of traditional Thai massage. See the monks’ morning chanting ritual here. Afterwards you take a tuk-tuk via Pak Klong Taland Flower Market towards The Grand Palace. Here you'll find the mysterious Emerald Buddha, the most revered Buddha image in Thailand. Then it’s on to the pier for a long-tailed boat ride through the “klongs” (canals) of Thonburi to feel the full flavour of Thai life. In the afternoon, drive to Chinatown to get a first-hand look at old Bangkok. Drink tea with the shop keepers or just walk along Yaworat Road and check out all the different shops here. After 12 exciting days of exploring three vibrant capital cities on your Southeast Asian adventure, transfer to the Airport for your flight home.